This week President Trump named Ronald Vietello as the new head of the US Border Patrol. But Trump clearly doesn’t follow Vietello on Twitter. Because if he did, he probably wouldn’t be too happy about this tweet comparing Trump to Dennis the Menace. The image was doing the rounds on internet forums in January and February of 2016 under the headline “I wonder what happened to Dennis the Menace when he got older?” The implication being, of course, that an obnoxious cartoon child who doesn’t know any better would later grow up to be an obnoxious cartoon manbaby running for president who doesn’t know any better. Twitter user @erinscafe was the first to spot the strange tweet. And it should probably be noted that back in March of 2016 Trump was the frontrunner for the Republican nomination but was far from a shoo-in for the presidency. But even so, President Trump doesn’t take very kindly to ridicule. In fact, he’s pretty infamous for his Twitter fights, no matter how petty. Vietello’s account is unverified, but it was started in November of 2013 and includes photos of Vitiello that do not appear elsewhere online. What else can we learn from Vietello’s Twitter account? He would apparently love to be an intern for Glenn Beck. He shares views with the Koch brothers. He’s a fan of the documentary Deli Man. 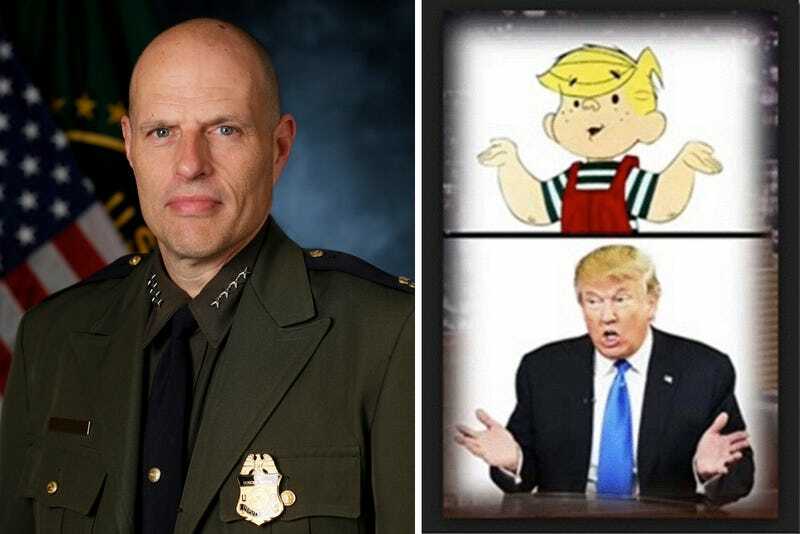 Gizmodo has reached out to US Customs and Border Protection for comment about the tweet comparing President Trump to Dennis the Menace and we’ll update this post when we hear back. Update February 10, 2:15pm: We still haven’t heard back from CBP, but one tipster did notice this other tweet where Vitiello compares the Democrats to the Ku Klux Klan, so that’s nice.